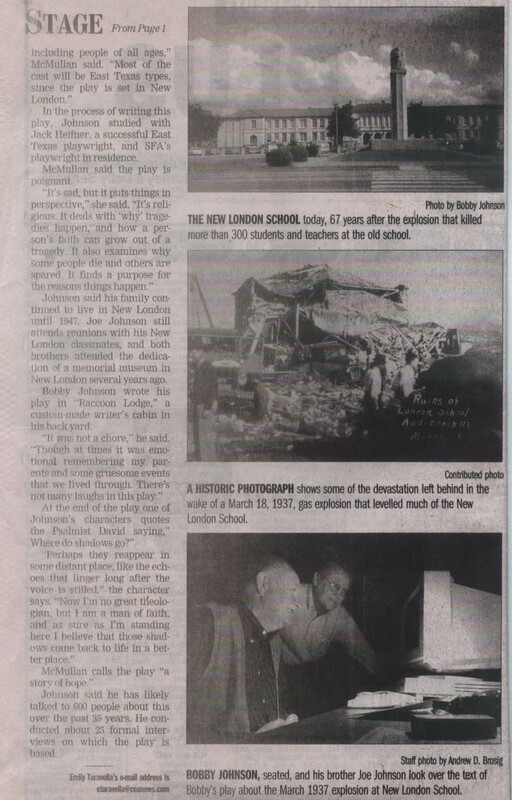 Although I was not born until 1955, all my life I heard my dad, Bill Hannon, talk about the New London School Explosion. At the time of the explosion in March, 1937, he was 19 years old and lived in one of the oil company camps outside of Arp, that were so prevalent in the Texas oil fields. His dad was employed as an crude oil tank builder by the Prairie Oil & Gas Company, which was the predecessor to what eventually became Arco. My dad said that when the explosion occurred, the windows rattled in the house they lived in. He did not say how far it was from New London but when word came down about the explosion, he took his Boy Scout troop to New London, where they pulled bodies out and helped move debris. Hindsight wishes I would have quizzed him more about the explosion and his role in the recovery effort, but unfortunately, he passed away in July, 1992. It would have been interesting to learn more about the explosion and subsequent activities from his perspective. According to my mom, my dad's sister, Margaret Hannon Scimeca, who was attending public school in either Arp or Troup, was supposed to have been at a scheduled ball game at the time of the explosion. However, the game had been postponed till later that afternoon because the gym was occupied. (I believe the PTA was meeting in the gym.) My aunt is still alive and we are sending her a copy of the Dallas Observer article. I would like to see what she has to say about it. I have not yet been to the museum in New London, but 4 or 5 years ago, on the local news, I saw a film clip from 1937 in which news personnel were interviewing people. It looked like it was for a newsreel clip that used to be shown at the movies. Anyway, one of the people they interviewed appeared to have on a Scout uniform and it appeared to be my dad. So hopefully, when I do finally get to the museum, I will be able to locate copies of newsreels from that time period and will be able to review that clip. The clip was on for just a few moments, so I did not get as good a look as I would have wished. MY NAME IS HOWARD H. HARRIS. AT THE TIME OF THE DISASTER I LIVED IN LONGVIEW AND WAS IN ATTENDANCE AT LONGVIEW HIGH SCHOOL FROM WHICH I GRADUATED IN 1939. WHEN THE EXPLOSION HAPPENED I WAS AT FOOTBALL PRACTICE AND THE BOY SCOUT TRANSPORTATION CAME TO PICK UP ALL BOY SCOUTS AND DELIVER US TO THE NEW LONDON SCHOOL TO ASSIST IN ANY WAY WE COULD. THERE IS ONE STORY I WOULD LIKE TO MAKE YOU AWARE OF IN CASE NO ONE ELSE HAS. AT SOME TIME DURING ALL OF THE CONFUSION AND MOURNING I SAW A SMALL BOY SITTING ON THE STEPS AT ONE OF THE EXITS FROM THE BUILDING THAT HAD ACTUALLY FALLEN DOWN AROUND HIM. HE HAD WALKED DOWN THE HALL AND USED THE FIRST EXIT HE FOUND (I AM ASSUMING THIS). I LOOKED HIM OVER FOR INJURIES AND ALL I FOUND WAS A VERY SMALL PIECE OF GLASS N HIS SHIRT POCKET. THATS HOW CLOSE HE CAME TO BEING KILLED. I WANTED TO TRY TO CALL HIS MOTHER BUT HE HAD NO IDEA WHAT IS NAME WAS. ONE OF THE ADULTS TOOK HIM AWAY AND I NEVER SAW HIM AGAIN. WONDERING ABOUT HIM HAS HAUNTED ME ALL THESE YEARS. I WOULD GIVE ANYTHING TO KNOW WHO HE WAS AND GET IN TOUCH WITH HIM IF POSSIBLE. DURING ALL OF THE TIME I WAS NEAR HIM HE DIDNT UTTER A WORD. HE DIDNT APPEAR TO BE FRIGHTENED. I DONT GUESS HE REALLY KNEW AT THAT POINT WHAT HAD HAPPENED TO HIM. I HAVE PRAYED MANY TIMES THAT HE WAS ALRIGHT. In March of 1937, 6-year-old Joe Johnson watched through the window of his school bus as the New London School exploded. "It went up in the air in one piece," he said. "Then it disintegrated." Joe had just left the high school auditorium, and he might well have been a victim if he had stayed to play outside during the PTA meeting. Instead, he got on the bus to go home. But nearly 300 others died. The New London explosion was one of the worst disasters in this nation's history. It made headlines across the globe and brought Walter Cronkite to East Texas. Sixty-seven years have passed since the tragedy, and Joe Johnson's brother, Dr. Bobby Johnson, is bringing the story to the stage. "I was just a baby when it happened," Bobby Johnson said. "But we all grew up in the shadow of the explosion." Joe remembers arriving home that fateful day. "My mother was a woman given to hysterics," he said. "She was out of her mind until she saw my bus — until she saw me walking down the street." Joe recalls that 18-month-old Bobby was in her arms. Johnye Johnson took her two sons to Oklahoma until the initial horror of the disaster had passed. Her husband, Harold Johnson, was among the thousands of volunteers who dug through the rubble searching for bodies. Bobby Johnson believes his father was haunted by the experience for the rest of his life. He wasn't alone. 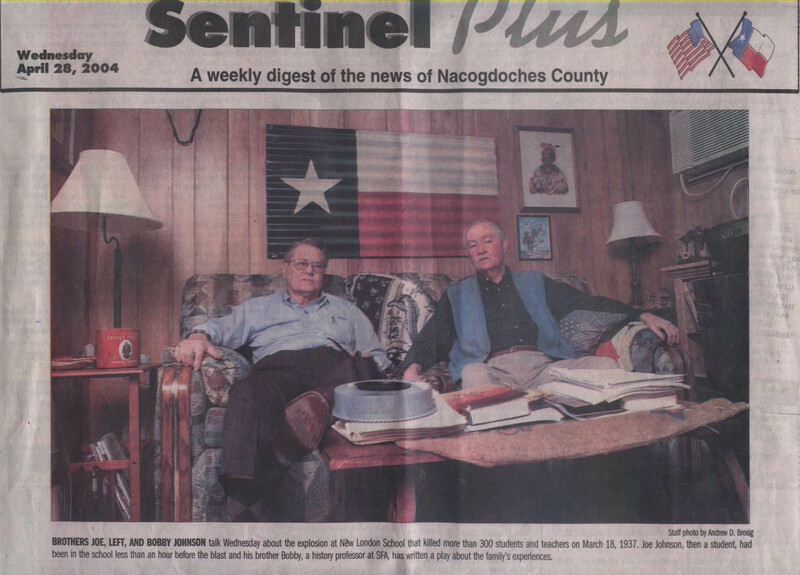 "When I conducted my first oral history project on the East Texas oil boom in the summer of 1970, virtually no one would talk about the disaster," Johnson said. "It was simply too painful. An entire generation was lost." 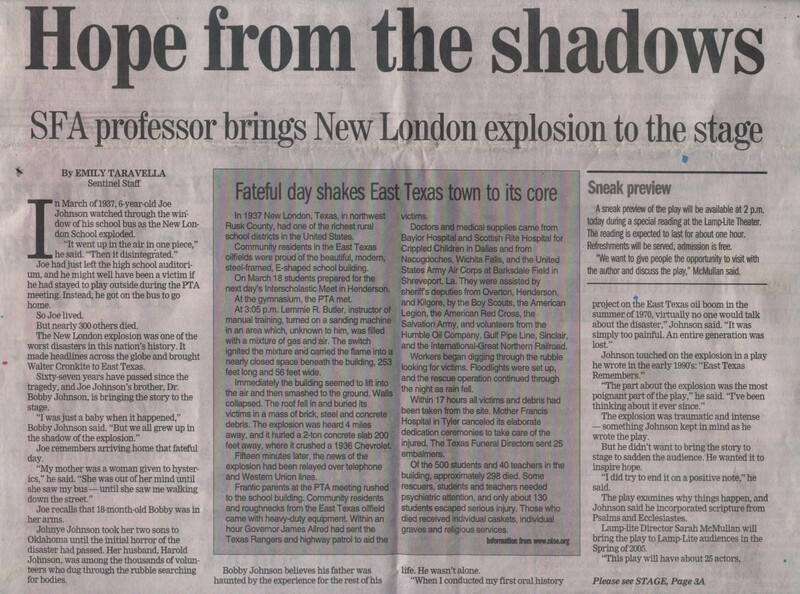 Johnson touched on the explosion in a play he wrote in the early 1990's: "East Texas Remembers." "The part about the explosion was the most poignant part of the play," he said. "I've been thinking about it ever since." The explosion was traumatic and intense — something Johnson kept in mind as he wrote the play. But he didn't want to bring the story to stage to sadden the audience. He wanted it to inspire hope. "I did try to end it on a positive note," he said. The play examines why things happen, and Johnson said he incorporated scripture from Psalms and Ecclesiastes. Lamp-lite Director Sarah McMullan will bring the play to Lamp-Lite audiences in the Spring of 2005. "This play will have about 25 actors, including people of all ages," McMullan said. "Most of the cast will be East Texas types, since the play is set in New London." In the process of writing this play, Johnson studied with Jack Heifner, a successful East Texas playwright, and SFA's playwright in residence. McMullan said the play is poignant. "It's sad, but it puts things in perspective," she said. "It's religious. It deals with 'why' tragedies happen, and how a person's faith can grow out of a tragedy. It also examines why some people die and others are spared. It finds a purpose for the reasons things happen." Johnson said his family continued to live in New London until 1947. Joe Johnson still attends reunions with his New London classmates, and both brothers attended the dedication of a memorial museum in New London several years ago. Bobby Johnson wrote his play in "Raccoon Lodge," a custom-made writer's cabin in his back yard. "It was not a chore," he said. "Though at times it was emotional remembering my parents and some gruesome events that we lived through. There's not many laughs in this play." At the end of the play one of Johnson's characters quotes the Psalmist David saying," Where do shadows go?" "Perhaps they reappear in some distant place, like the echoes that linger long after the voice is stilled," the character says. "Now I'm no great theologian, but I am a man of faith, and as sure as I'm standing here I believe that those shadows come back to life in a better place." McMullan calls the play "a story of hope." Johnson said he has likely talked to 600 people about this over the past 35 years. He conducted about 25 formal interviews on which the play is based. In 1937 New London, Texas, in northwest Rusk County, had one of the richest rural school districts in the United States. Community residents in the East Texas oilfields were proud of the beautiful, modern, steel-framed, E-shaped school building. On March 18 students prepared for the next day's Interscholastic Meet in Henderson. At the gymnasium, the PTA met. At 3:05 p.m. Lemmie R. Butler, instructor of manual training, turned on a sanding machine in an area which, unknown to him, was filled with a mixture of gas and air. The switch ignited the mixture and carried the flame into a nearly closed space beneath the building, 253 feet long and 56 feet wide. Immediately the building seemed to lift into the air and then smashed to the ground. Walls collapsed. The roof fell in and buried its victims in a mass of brick, steel and concrete debris. The explosion was heard 4 miles away, and it hurled a 2-ton concrete slab 200 feet away, where it crushed a 1936 Chevrolet. Fifteen minutes later, the news of the explosion had been relayed over telephone and Western Union lines. Frantic parents at the PTA meeting rushed to the school building. Community residents and roughnecks from the East Texas oilfield came with heavy-duty equipment. Within an hour Governor James Allred had sent the Texas Rangers and highway patrol to aid the victims. Doctors and medical supplies came from Baylor Hospital and Scottish Rite Hospital for Crippled Children in Dallas and from Nacogdoches, Wichita Falls, and the United States Army Air Corps at Barksdale Field in Shreveport, La. They were assisted by sheriff's deputies from Overton, Henderson, and Kilgore, by the Boy Scouts, the American Legion, the American Red Cross, the Salvation Army, and volunteers from the Humble Oil Company, Gulf Pipe Line, Sinclair, and the International-Great Northern Railroad. Workers began digging through the rubble looking for victims. Floodlights were set up, and the rescue operation continued through the night as rain fell. Within 17 hours all victims and debris had been taken from the site. Mother Francis Hospital in Tyler canceled its elaborate dedication ceremonies to take care of the injured. The Texas Funeral Directors sent 25 embalmers. Of the 500 students and 40 teachers in the building, approximately 298 died. Some rescuers, students and teachers needed psychiatric attention, and only about 130 students escaped serious injury. Those who died received individual caskets, individual graves and religious services. Additional Resources: Photo Images Of the Actual News paper Clipping Are Available. Click the links below to view full size images.